Bacopa monnieri (Brahmi or water hyssop), is a plant belonging to the family Scrophulariaceae, that has been used in the traditional system of Ayurvedic medicine. Practitioners of Ayurveda claim varying benefits from Bacopa, including improved cognitive functions, intelligence and memory. Bacopa is a widely used supplement generally considered to be safe. In clinical trials on cognitive function, Bacopa extract is often administered at 300 mg/day. Some Brahmi supplements are standardized to contain a certain percentage of bacosides, the components that are believed to be biologically active. Alzheimer’s disease (AD) is a chronic neurodegenerative disease of undetermined etiology, seen in the elderly people (rarely before 60). Disease is characterized by the impairment of memory, cognitive abilities and vocabulary. The pathogenesis of AD is not completely unknown, but it looks like some genes play an important role in AD: presenelin-1 (PSEN-1), amyloid precursor protein (APP), presenelin-2 (PSEN-2), and apolipoprotein E (APOE). There are 3 possible mechanisms AD developement: deposition of Aβ proteins, deposition of τ proteins in cytoplasm of neurons, and neuronal degeneration due to above 2 components. Bacopa is a nootropic due to its: antioxidant, cholinergic, anti-beta amyloid properties. Many animal studies revealed that Bacopa extract has an antioxidant and free radical scavenging action. Early studies showed that Bacopa extract inhibits lipid peroxidation in prefrontal cortex, hippocampus, and striatum of rats. Some experiments demonstrate the cholinergic effects of Bacopa which are similar to the current treatments of Alzheimer’s disease like: donepezil, rivastigmine and galantamine. Administration of Bacopa extracts also increases cerebral blood flow and the expression of brain derived neurotrophic factor (BDNF) – marker of neuronal plasticity. Bacopa extracts also decreases the formation of amyloid fibrils. All Experiments strongly indicate the value of Brahmi as a promising agent in Alzheimer’s disease and other neurodegenerative disease. 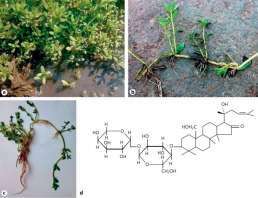 Bacopa monnieri: a Plant growing in marshlands; b, c Plant morphology; d chemical structure of bacoside. So would you recommend starting this in one’s late forties just to help prevent Alzheimer’s and other neurodegenerative diseases ?